BRING ANY ITEMS YOU WANT TO GET SIGNED OR PURCHASE HELMETS, PHOTOS, BALLS, AND MEMORABILIA AVAILABLE THE DAY OF THE SIGNING. NFL Running Back Frank Gore is the greatest running back in 49ers history. He also had an incredible first season with the Miami Dolphins with over 700 running yards averaging over 4.6 yards per carry. Frank Gore is currently 4th on the NFL's All Time Rushing Yards Leaders with 14,748 career rushing yards. Frank Gore recently signed with the Buffalo Bills in 2019. 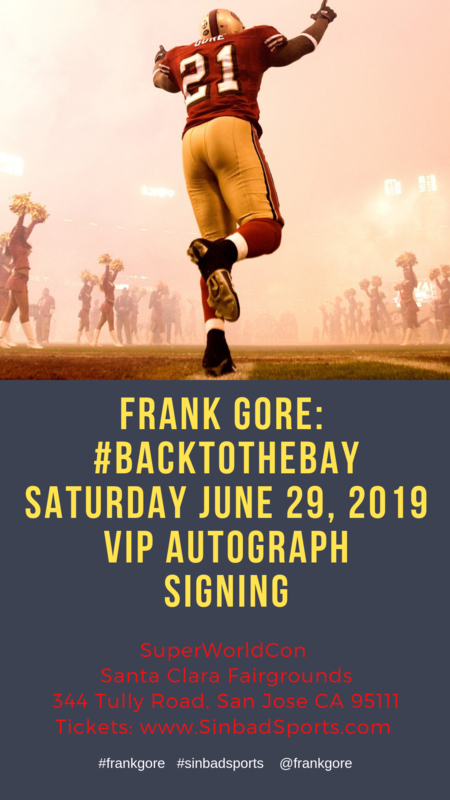 At the last Back to the Bay VIP Autograph Signing Sinbad Sports hosted, we sold out so get your tickets now!